Last week I butchered a lamb. The animal was the right size but it was a bit lean, hardly any fat on it all all, just under a year old and only fed on grass. I've done a bit of amateur butchery in the past and I have tackled animals bigger than this. I was surprised by how straight forward it was to butcher a lamb, I found the whole process really interesting. I did it using a YouTube video, Dawn recommended Scott Rea and I wasn't disappointed, it was really clear and straight froward, took me a few hours but I know the next one would be half the time. Breaking the carcass down. After this point everything seemed easy. Breast jointed boned out and rolled. Need to learn the proper knots though! After jointing the animal up there was a bag of trimmings. I wasn't sure what to do with it, we've still got plenty of beef mince in the freezer and Cottage and Shepard's pie aren't that different in taste. Then my wife mentioned lamb burgers! I got the mincer out and fed it all through (the mincer has turned out to be a good investment). 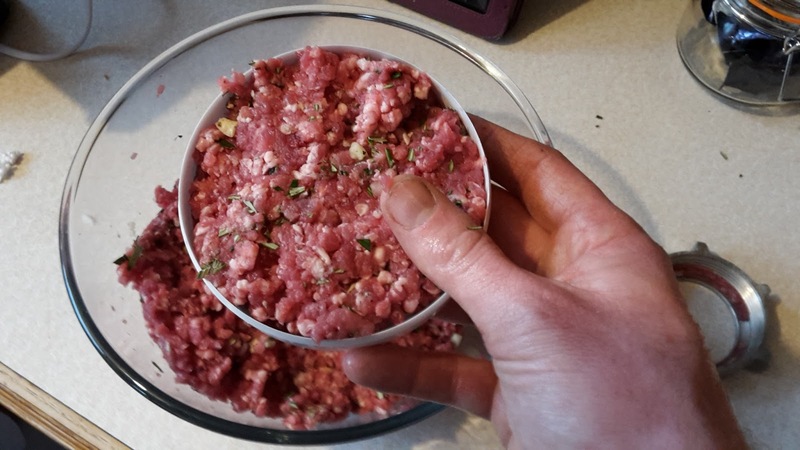 Then I chopped up loads of rosemary and garlic mixed with salt and pepper and added it to my mince mix. 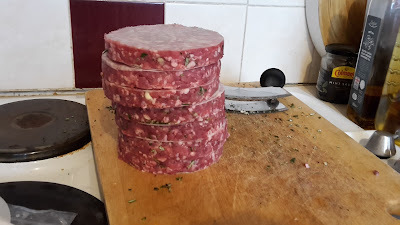 I made the burgers with a burger making press, each is separated by some grease proof paper, it's good because when they go in the freezer you can then break off as many as you like. I can't wait to try these when we have a BBQ in the summer! So some more meat added to the freezer, we've already eaten half a shoulder I boned out, that did us for a roast and a really good lamb stir fry. I've also had devilled kidneys on toast and liver in onion gravy. 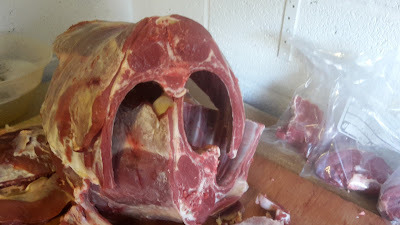 Who else has butchered a whole animal? Did you enjoy the process? I found that I learnt so much about the animal and where the cuts were from. Done a few deer, but not had a chance to butcher any lamb yet. The hardest part was the first pierce of the skin with the knife in order to gut it. Somehow it just goes contrary to instinct. 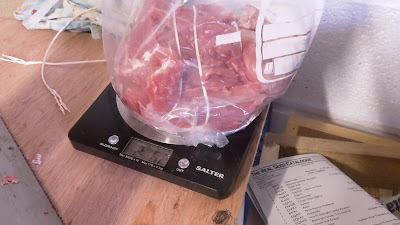 The smells when gutting take a bit getting used too, but the rest of the processing seemed quite reasonable. Yeah, never a fan of the smell, like you said the first cut is hardest, but once you get going the rest is straight forward. I think the next one will be easier as I'll have more of an idea! It does look very fat free! 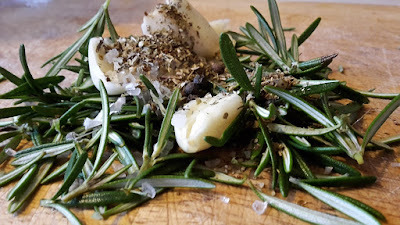 I've not butchered a Lamb, but I have roasted a whole one! I like the sound of that! Good for a summer BBQ! i love haggis and any offal to be honest! I'd like to try goat, still on my list to eat! The lamb burgers look amazing ! Do let us know how they taste ! Yeah, I was pleased with how they looked, Need to wait for a good sunny weekend first! I have been butchering our lambs for over thirty years now. (long before google so used the picture of named joints in an old cookery book) This way I can have the joints the size I want them and the breasts left whole etc. etc. I have butchered pigs, though struggled to keep the carcasses cool enough to work with as they slip about a bit when not chilled. When we had two steers killed a retired butcher friend spent the WHOLE weekend butchering for us in our kitchen. 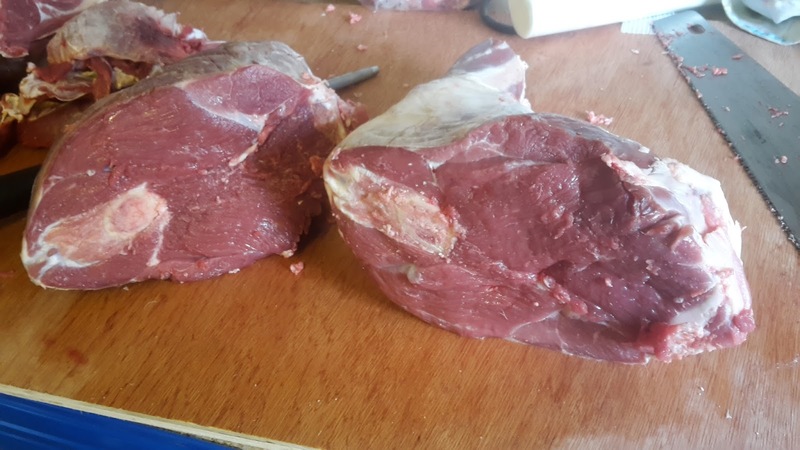 He said he had never butchered a whole cow before, as they usually take joints off and hang the rest in the freezer for another time. I think I might blog about that weekend sometime! The beef animal I did took me an age! I spent the best part of a week with every spare minute going into the shed to have another go! It was worth it though and we've never eaten so much beef! I'd love to have you show me how you butcher a lamb, I think I could learn a lot. 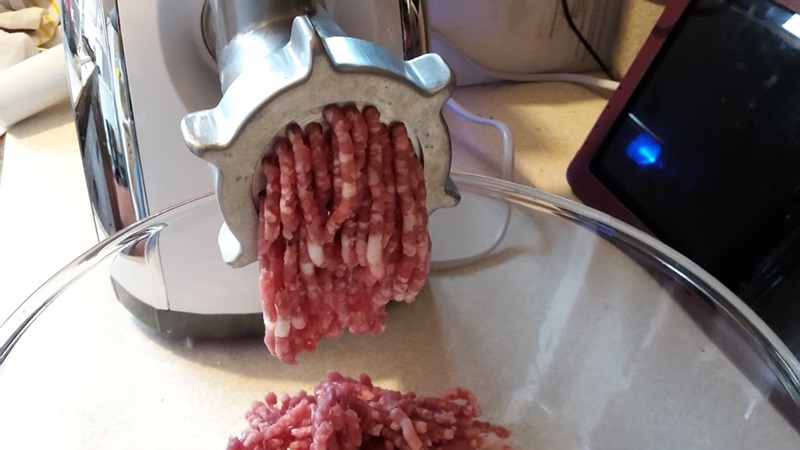 You mentioned learning to tie a knot for your meats. 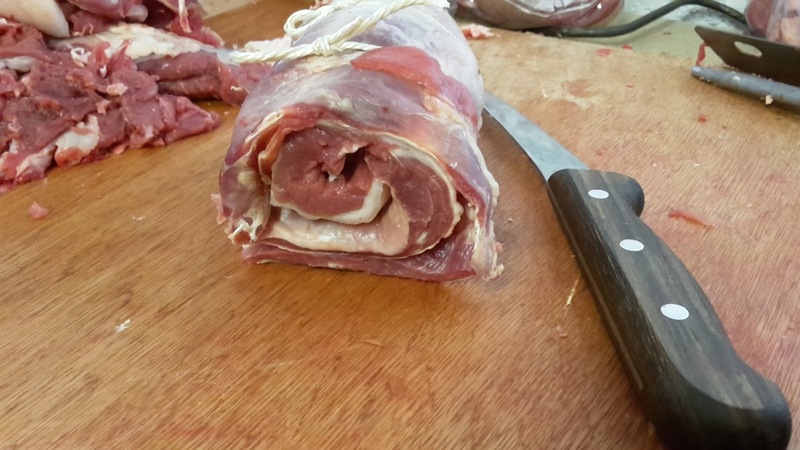 Here is a to the very best 'how to tie a butcher's knot' video I have ever seen. This guy ties the knot exactly like my old relative who worked as a butcher in a grocery store for years. He did it so fast I could never figure out how he did it, but this video shows exactly what he was doing. Easy as pie once you get the hang of it. Great resource thanks, I'll have a practice before I do the next one! The only animal I've helped with are deer but I love the process and work, is that odd? 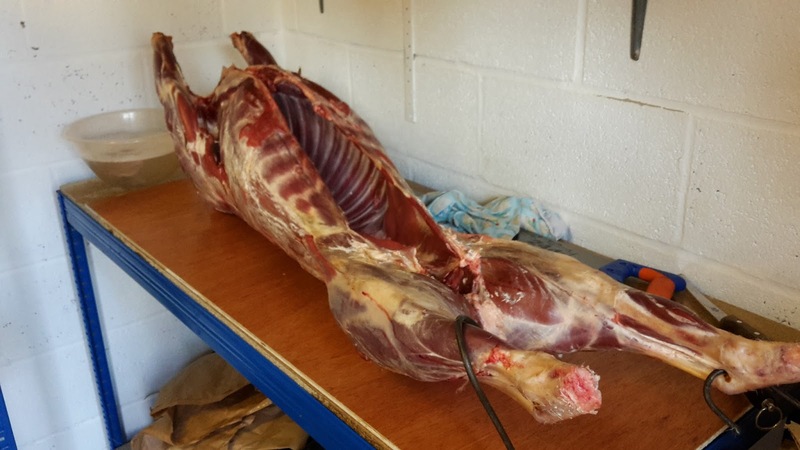 Forgot to ask if you hang the lamb to dry age at all? I think I'd have no trouble selling the lamb burgers! I hung the lamb for just under a week, I have no cold store so I have to watch temperature. We also slaughter and butcher our lambs as well, and best meat ever! It's nice being the whole field to fork story! Yes I'm looking forward to trying them! Glad you like the blog!